Around half of all US dog owners take their pets on vacation with them. This practice is becoming increasingly common and while it’s fun to have your furry friend traveling alongside you, at sometimes it can be a bit of a hassle. It’s important to plan ahead before traveling with your pet. 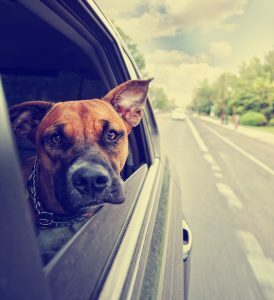 With that in mind, here are some things to consider before you hit the road with your furry friend! First, make sure that your pet’s identification and other documentation is prepared so that you can have a smooth flight experience. We also encourage you to take your pet’s ID tags with you, just to be safe. Of course, research beforehand to see whether the airline allows dogs and cats, and what their protocol is. Keep in mind that if your pet is very young or has health issues, it might be best to find your pet a place to stay while you’re away. While waiting in the airport, be sure to stop by the airport relief station. It’s also a good idea to exercise and walk your pet as much as possible before boarding. This will help to put your pet to sleep, making your travel experience easier. Speaking of that, we also encourage you to relax. Taking a pet on a trip with you might seem stressful, but it doesn’t have to be. As long as you are prepared for the challenges in front of you, it will be more than ok. Patience and preparation are key. Before traveling in a car with your pet, try to do a trial run on a shorter trip. See how they behave and if they feel comfortable. If you are going on a road trip, it’s important to buckle up and keep your pet safe, as lots of accidents involve pets not being secured properly. Bring a small transportation cage, just to be safe. Hydration is crucial, so make sure that you have some water handy at all times. And yes, you will need to make some pit stops along the way, as your pet will have to go to the bathroom once every few hours. Remember to freshen up the airflow in your car, as pets can have problems with high temperatures. It can definitely a bit of a challenge to go on vacation with your pet. But it is also a great chance to spend some quality time with your pet. Just be positive about it, prepare your pet and any meds or documentation, then you will be more than okay! To make sure your pet is healthy and prepared to travel, be sure to schedule an appointment with us today by calling (775) 853-6900. We here at Mountain View Animal Hospital & Holistic Pet Care are happy to help you and your pet have a great time. Safe travels!